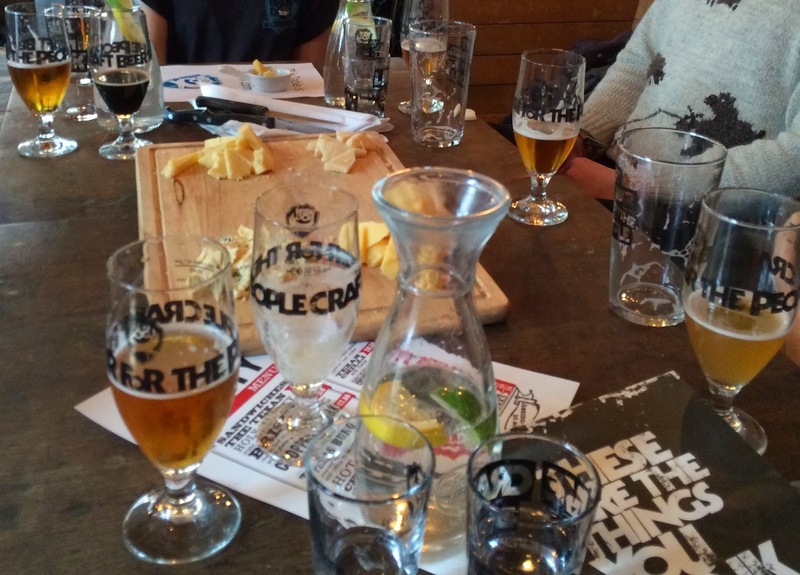 Beer and cheese tasting at BrewDog, Shoreditch. The tasting was presented by Tida who took us through the four pairings. All the beers are Brewdog's own, all the cheeses came from Neal's Yard Dairy. Punk IPA (5.4%) paired with Parmesan. Hints of citrus (grapefruit) match the tangyness of the parmesan; a good match. 5am Saint (5.0%) paired with Coolea. A creamy cheese from boggy grass fed cattle; not as successful as the Punk / Parmesan pairing. Dead Pony Club (3.8%) paired with Hafod Cheddar. A california style beer with hints of tropical fruit (pineapple); the most complementary pairing of the session. Ripe Tide (8.0%) paired with Stichelton Blue. An imperial stout with some sweetness; like drinking port with Stilton - a classic combo. This squirrel is one of the bottles that once contained "The End of History" the world's strongest beer at the time with an ABV of 55% (yes, that is fifty-five percent). More from the BBC: "Dead animal beer bottles at £500 each 'perverse'"
After the tasting we stayed on to chat and drink a couple more half pints of Rip Tide - at 8% ABV more would have been foolish. A fun way to spend a Sunday afternoon and meet some new beers.